Farrar, Straus and Giroux, 2018. It’s hard to speak or write well about poetry, and doubly so about poetry and God, particularly in America, where the ubiquity of religious discourse transforms every attempt into a cliché. There’s something almost immediately vapid, isn’t there, in referring to a poem as a “prayer” (a conceit, alas, I have used myself) or in noting an artist’s “redemptive” use of this or that material? Terms like “incarnation” or “presence”—both good words—have become nearly useless with respect to poetry because of overuse, making poetry into a pill of mild euphoria to be consumed on a gloomy Saturday morning. Never mind that both God and poetry can be terrifying, as they speak judgments against us or converse with Hell’s demons. I love long thought—because I have long felt—that the perfections of art implied or even anticipated some ultimate order one need not call God, but could call out to nonetheless; that a feeling that found its true form could align the heart with the stars, make of remote and implacable matter a mirror in which subject and object might see, and even be, each other. Wiman differs in this respect from most modern poets, who, following Wordsworth, tend to see poetry as an activity that reconciles subject and object, spirit and matter, even if that reconciliation is momentary. In The Prelude, Wordsworth hoped to discover and make visible that “Invisible workmanship” that holds all things together. Stéphane Mallarmé claimed that his long poem, “One Toss of the Dice,” which was to be part of an even larger work he called The Book, had “laid the foundation of a magnificent work” that would “explain all earthly existence.” “I am dead and resurrected,” he wrote the poet Théodore Aubanel in 1866, “with the jeweled key of the ultimate treasure chest of my mind.” He never finished The Book. In which being there together is enough. This focus on oblivion may also be a rhetorical move. In My Bright Abyss, he states in a comment on Simone Weil that modern believers connect to God by inhabiting “those elements of our existence that seem inimical to his: limitedness, contingency, suffering, death,” hence the focus on oblivion in both works. Still, I found Wiman’s preoccupation with oblivion in He Held Radical Light a little odd on occasion. Poetry is certainly preoccupied with unity, but it is also preoccupied with things—real gardens and real toads, to riff on Marianne Moore a little. Poetry is chockablock with the strange and varied life of things. 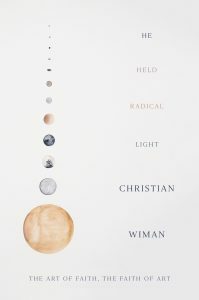 Talk of the afterlife in Christianity, Wiman writes in My Bright Abyss, “seems absurd to me.” Fair enough, but I think we may be losing something by making it somewhat less absurd, somewhat too neat, as Wiman does in He Held Radical Light. Still, this is a rewarding book—one of the best on poetry and faith in recent years—and I hope it won’t be Wiman’s last. Micah Mattix edits the daily Prufrock newsletter on books, arts, and ideas.